An outdoor temperature of about 2 degrees Fahrenheit this morning highlighted what a great time winter is for NOT gardening, but for reading about gardening. A lot of gardening books, new and old, end up on my bookshelves, and I’d like to note a few favorites new to my shelves last year. 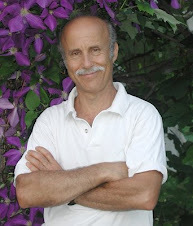 For anyone serious about vegetable growing, Eliot Coleman, gardener extraordinaire, has done it again. The Winter Harvest Handbook builds on his The New Organic Grower and Four Season Harvest, delving into innovative techniques for growing vegetables more efficiently and year ‘round, with minimum heat inputs even in northern climates. The rest of winter’s fresh garden vegetables are not in the garden. Most are in plywood boxes stacked in out my mudroom, where temperatures usually hover just above freezing. One box houses turnips picked around the middle of December. They – Purple Top White Globe, Gold Ball, and Oasis – all look and taste as fresh as the day they were picked. (Note to myself: Don’t grow Gold Ball turnip next year; it tastes too much like a rutabaga to me.) The turnips are delicious cooked or chopped fresh into salads. The same day I pulled the turnips I also dug up leeks, now nestled into the box along with the turnips. 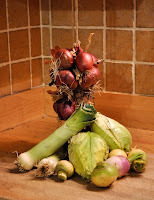 With snow cover, both leeks and turnips probably would survive winter out in the garden, but stepping out into the mudroom and reaching into a box is easier than chopping through ice and snow out in the garden to get at these vegetables. Shearing back leaves from the tops of the leeks cuts down moisture loss from the fat, white shafts, so the leeks also taste as fresh as the day they were harvested. Another box has a few heads of cabbage, also harvested that day in December. Lopping off the outer leaves, which anyway were looking ragged and slug-eaten, cuts water loss from the tight heads and keeps them fresh, just as cutting back leaves did for the leeks. Step down, now, into my basement and you’ll see braids of onions and garlic hanging from nails in the rafters. 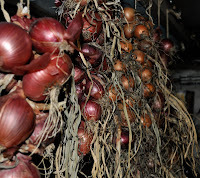 The onions are the variety Copra and a forgotten variety of red onion, both sweet and still firm. So that’s my assessment of what’s now “fresh from the garden” in winter. Most years I would still have winter squashes. They were a total crop failure because of rain and because of the wood shavings I dug into the soil. (The squashes suffered nitrogen deficiency because I failed to add enough nitrogen fertilizer to offset the temporary nitrogen tie-up caused by microorganisms that decompose the shavings). Also, no mention has been made of the lettuces, mâche, kale, chard, and other fresh greens. But they’re all indoors, in the greenhouse. I may be addicted to blueberries. I now eat them practically every morning practically year ‘round. 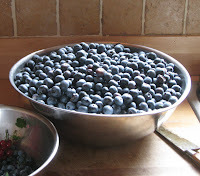 That’s fresh blueberries beginning at the end of June, and frozen ones from mid-September on. I pace myself. Deb and I started with 67 bags (each bag about 5 cups) in the freezer in September and have only used 21 so far. Consumed at the rate of about 5 bags a month, that should keep us “berry happy” on into May. I highly recommend planting blueberries. 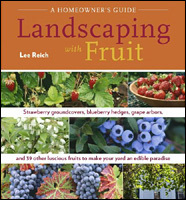 They are easy to grow organically, the plants are beautiful, and the berries are very healthful and taste great. They’re also easy to freeze: Just spread them on a tray until frozen, then pack them into bags. Their only requirements are suitable soil, easily made so, and protection from birds, with netting. Each bush will net you 8 pounds, or more, of berries. Thawed in the refrigerator, the berries taste as good as fresh ones. Or maybe I think that because it’s now been so long since I’ve had a fresh blueberry. Man cannot, of course, live by bread alone. 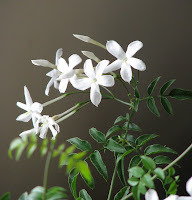 So I’m still awaiting fragrant blossoms on my jasmine plant. This plant is “winter jasmine” (Jasminium polyantha), which has occasionally bloomed well for me. Last year, I learned that the plant needs cool night temperatures (below 60 degrees F.) plus some drought to bloom well. My plants definitely got the cool temperatures, first outdoors and then in the cool greenhouse, with temperatures around 40 degrees F. The plant has had enough food, as indicated by healthy growth and good leaf color. The plant had sufficient light, first in the greenhouse and now in a south-facing window. But drought? Evidently not enough. It’s time for some tough love with the jasmine. The plant will wilt. And then the plant will – I hope – explode into an extravaganza of fragrant, white blossoms. A friend gave me a ponytail palm (Beaucarnea recurvata) back in 1981, and up to this summer it looked something like a palm tree sitting atop a large onion. Or a long-leafed dracena plant whose stem, near ground level, had swollen almost to the size of a bowling ball. The plant looked very interesting, but not particularly attractive, and the sharp edges of its long, strappy leaves were getting bothersome. So last summer, I was going to toss the plant in the compost pile; instead, I lopped off its top to about 3 feet in height. What remained was nothing more than the bulbous trunk out of whose top arose a bare stem. After pruning, I ignored the plant just as I had done for the past 3 decades. Ponytail palm doesn’t crave attention. As testimonial to the ability of the bulbous trunk to store water, the plant went months between waterings. What’s more, it’s been growing in the same pot with the same potting soil for all these years, no small accomplishment with the bulbous base of the plant, rather than potting soil, occupying much of volume within the pot. And fertilization? A rare event. Now for the good part: Since being decapitated, the ponytail palm has sprouted tufts of leaves in various places. A few new sprouts appeared near the top of the plant, just as most plants would do when the top bud or portion of a stem is cut back. A tuft also appeared lower down along the stem. And seemingly out of nowhere, a couple of tufts of leaves sprung from the rounded surface of the swollen bulb. Over time, each of those tufts of leaves is going to elongate into a stem capped by a tuft of leaves. The plant is more verdant and very attractive now, and I should be able to direct its growth to remain so. If not, I can lop back one or more ponytails and start again. 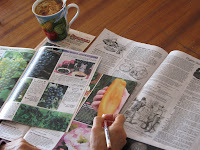 Years ago, the routine was that seed catalogues would arrive in the mail sometime after January and all of us gardeners would place our orders to receive seeds a couple of months later. Now, I have catalogs that have already been sitting on my kitchen table for a few weeks, with orders waiting to be finalized. And not primitively finalized, with pen and paper, but seamlessly, on the internet. Seed companies realized that the early bird gets the worm: We gardeners, once cold weather has set in, are likely to get seduced by any reference to fresh tomatoes, so are most likely to order from the first catalogs we see. All this is for the better, for me, at least, because my efforts to limit down time in the garden mean that I need to have seeds in hand and ready to sow that much sooner. Onion and leek seeds get sown in seed flats at the beginning of February, lettuce follows soon after that, along with pansies and snapdragons, and the march continues from then on right through September. One thing that has not changed over the years is that I’m still enticed and thankful by what we gardeners have at our fingertips. From just a phone call, a few dollars, or a few computer keystrokes, plants from all over the world end up in my garden. How can I resist trying Ruby Mist Love Grass, Cajun Jewel Okra, and Blazing Stars this year, along with such old standbys as Buttercrunch lettuce, Blue Lake beans, and Lemon Gem marigolds?